Celebrate the academic achievements of this year's graduating class by attending the University of Minnesota Crookston Commencement ceremony on campus or watch it live via the web! UMN Crookston holds one campus-wide ceremony each year in May. Attendance at your celebration is voluntary. Commencement is a ceremonial event that includes the wearing of the traditional academic cap and gown by graduates and faculty. Commencement is not a certification of graduation. Your graduation date and transcript date will be different from your commencement date. Students registered for courses that complete their degree requirements may participate in commencement exercises. This includes the student's spring term, summer session, and up to 16 credits of fall term registration. Degree candidates must complete an electronic application for degree with the Office of the Registrar by the end of the second week of the term/semester in which degree requirements will be met. The commencement ceremony lasts approximately one and a half to two hours. Degree candidates line up early for the ceremony. Wear comfortable shoes and plan to leave belongings with friends or family. The presentation of degree candidates is the highlight of the event. Your family and friends are welcome to take photos during the ceremony as long as they don't disturb the enjoyment of others. You can get your cap and gown through the UMN Crookston Bookstore. Students who complete the E-Degree Application will receive information regarding the ordering of cap and gown from the UMN Crookston Bookstore at a later date. Because it is not possible to process final grades and prepare degree lists in time to present diplomas on commencement day, your diploma will be mailed about two months after the end of the semester. All undergraduate diplomas are 8.5 x 11 inches. You may purchase covers and frames and related graduation items at the UMN Crookston Bookstore. The caps and gowns worn by graduates and faculty are based on costumes used in universities of the 14th and 15th centuries, particularly at Oxford and Cambridge universities in England. This academic dress has been used in the United States from colonial times and was standardized by an 1895 Intercollegiate Code. Like the military of medieval times with its pages, squires, and knights, the academic world has long had three basic grades of dignity and achievement: bachelors, masters, or doctors. The distinction between masters and doctors is comparatively recent; both imply the right to teach. Black is the most common color for academic gowns. There is no trimming on the gowns for the bachelor’s or master’s degrees. For the doctoral degree, the gown is faced down the front with black or colored velvet and with three bars of the same color across the sleeves. The color in the master’s costume is restricted to the hood worn around the neck and down the back. This is edged with velvet or a color which indicates the subject area of the degree received, and is lined with silk in the colors of the institution which granted the degree. Doctors have a larger and more open hood lined, like the master’s hood, with the colors of the degree-granting institution and trimmed with the color of the subject area of the degree received. Gowns have black or colored velvet on the sleeves and the front. Adapted in part from American Universities and Colleges, 11th edition, Washington, American Council on Education, 1971. The mortarboard cap is traditionally black, but the tassel comes in various colors, each designed to signify the degree that the graduate has earned. The origin of these colors is centuries old, and, in the U.S., the colors have been standardized and accepted by the American Council on Education (ACE). 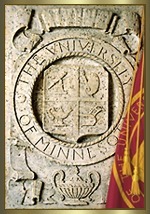 At UMN Crookston, four tassels are offered corresponding to the academic department of the major the student completes. Undergraduate candidates wear the tassel on the right side of the cap until their degree is conferred when the tassel is moved to the left side. Official University of Minnesota honor cords denoting graduation with Distinction and High Distinction (distributed through the Office of the Registrar). Official honor cords denoting participation in the UMC Honors Program (distributed by the Honors Program). Approved stoles for international students and students who have completed a study abroad experience (distributed through the Office of International Programs). Approved honor cords signifying military service or veterans status (distributed by the Office of Development & Alumni Relations and Veterans Services). Approved stoles signifying a graduate’s cultural heritage (these are optional and available to purchase through the UMN Crookston Bookstore). A chenille letter M worn on the grad’s left lapel area of the gown denoting participation in varsity athletics (distributed by Athletics and the Office of Development & Alumni Relations). Lapel pins worn on the left lapel area of the gown or stoles or cords distributed by and representing officially recognized student organizations (note: these must be approved in advance by the Commencement Committee). 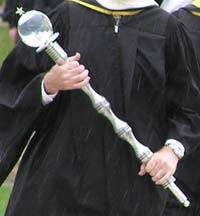 The Mace is used for all University of Minnesota commencements. The word “mace” is from Middle English and was originally used to refer to the implement for breaking armor during the Middle Ages. Today its use is more peaceful, for it now is a staff borne by, carried before, or placed near a dignitary as an insignia of his dignity and authority. First designed in 1961 for the inauguration of O. Meredith Wilson, the original mace is made of aluminum and topped by a crystal ball, which symbolizes the illuminating quality and the clarity of thinking that characterizes education. The crystal ball is topped by a star representing Minnesota, the North Star State. The staff is carried by the most senior professor of the college. A tradition unique to the UMN Crookston is the presence of a torch at special ceremonies. The symbolic light of the academic torch—the light of knowledge that permits understanding—represents the educational philosophy of the University of Minnesota. There are actually three different torches that play a role in the history of the campus. The first is the original torch created by the final graduating class of the Northwest School of Agriculture (NWSA) and passed to the first graduating class of the Technical Institute in 1968. That torch is on display in the Heritage Room in Kiehle Building. In 2002, regional artist David Badman designed and handcrafted a new academic torch as a gift to the campus in recognition of its new academic mission as a baccalaureate university. That torch has been present at all commencement ceremonies and other special campus events since that time. In 2009, Lew Hanson, an employee of the University, and DeBoer Industries of Crookston created a new torch, called the Century Torch, to commemorate the 100th anniversary of graduation ceremonies on the Crookston campus. Inscribed on the handle of this torch are the five core values of the UMN Crookston: Integrity, Excellence, Diversity, Innovation, and Learner Centeredness. During the commencement ceremony, the Century Torch is passed to the incoming president of the Crookston Student Association (CSA), maintaining the tradition that began in 1968 and acknowledging the history of the campus from its roots in the NWSA to the present.